London Underground electric subway train, 1938 stock. The train consists of 7 cars, of which 3 motorized and 4 motorless cars. 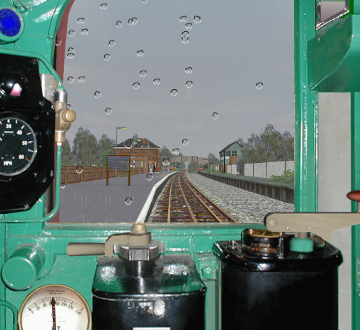 Photorealistic driver's stand with moving brake and power handles and working indicators. In OpenBVE there may be a problem with non-transparency that shows as blue squares around the brake and power handles. That has been fixed in the download provided at this website. The website where this train was distributed has disappeared from the Internet long ago. While there is no official website for the train, it can be downloaded from this website. 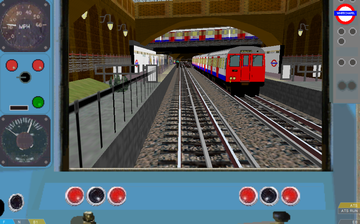 London Underground 1938 stock, sound adapted for Epping--Ongar route, panel adapted to work with OpenBVE without transparency problems. LU class A60/A62 subway train. The only difference between class A60 and class A62 is that they are manufactured in different batches. Drivers stand with speedometer. The power and brake handles moves with the simulation. The website that hosted this train has disappeared from the Internet long ago.